Visakhapatnam tourist places: Visakhapatnam district is one of the curical districts in north coastal districts in Andhra Pradesh. It has Odhisha on the north side, east Godavari district on south, Odhisha on west and Bay of Bengal on east as borders. Visakha district can be divided into three parts, the rural area, urban area and the agency area. 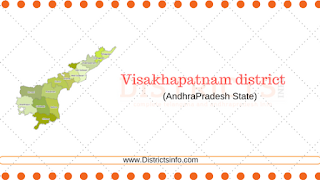 Visakhapatnam district is spread in an area of 11,161 kilometers. Forest are is 42.1 percent. 36.1 percent land is useful for agriculture. The district is divided into three revenue divisions and forty three mandals.  Kailasagiri: Kailasagiri hills i spread in around 350 acres and beautiful park is deveoped here. Water fountains, microwave repeater station, flower clock and Titanic View point mesmerize the visitors. There are huge idols of Shiva and Parvathi. Special attractions of Kailasagiri are the ropeway and the circular train.  Ramakrishna beach: Ramakrishna beatch is very suitable to get relaxed. There is a Kalimata temple nearby which is must a must see place for the tourists.  Kurumpam tomb: This tomb is built in the memory of Kurumpam queen. This is popualr as Taj Mahal of Visakha.  Rishikonda beach: This is at a distance of 8 kilometers from Visakhapatnam and is a place to be visited. Twelve AP tourism cottages are avilable here for the tourists.  Totlakonda is 15 kilometers away from Visakhapatnam and is 128 kilometers above the sealevel.  Simhachalam is 16 kilometers away form Visakhapatnam city. It has nearly six hundred years of history. Devotees believe that Narasimha Swamy resides on this hill. Thousands of devotees visit this temple everyday.  Nukambika temple is at a distance of 36 kilometers from Visakhapatnam. Devotees come to visit this temple from Odhisha, Maharashtra and Karnataka districts also.